Syriza (or the Coalition of the Radical Left) won the Greek referendum of the 5 July 2015, on the basis of an unequivocal anti-austerity political platform. 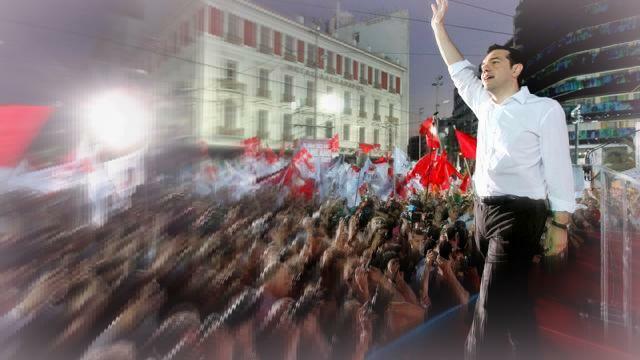 The Thessaloniki Program of Syriza demanded the scrapping of most of the public debt of the country, while their social-democratic agenda proclaimed, amongst others, that the party would: raise the minimum wage by 10%; increase income tax to 75% on all incomes above R6 million; combat the banks’ secret measures and the flight of capital; nationalise the banks; cut military expenditure; use buildings owned by the government, banks and churches for the homeless; open dining rooms in public schools to offer free breakfast and lunch to children. The mobilization around the referendum undeniably constituted an insurrectionary moment when 61% of the Greek people voted against the austerity measures. As usual, with liberal-democratic elections the left-wing wins when there is an upturn in social class strife. The Tsipras leadership, unfortunately, were flabbergasted by this outcome as they expected a narrow victory, and did not have a strategy in place about how to move forward. Nevertheless, the aftermath of the referendum could not prevent the Greek working people from being humiliated by the diktats of the troika, which compelled the entire country to be subjected to their rapacious ideology. Consequently, the unemployment rate in Greece hovers around Great Depression levels of 24.9% (May 2015), while youth unemployment is 49.7% (March 2015). Malnutrition soared to 54% and there has been a 35% upsurge in suicides in Greece since 2011. A staggering 92% of the so-called bailout funds ended up primarily with banks of Germany and France. Moreover, all this has been followed by massive privatizations – at rock-bottom prices – of several Greek airports, islands, ports, and so forth, first and foremost to German big business. In other words, a mass looting of Greek resources – directed by the European Central Bank, the European Commission and the International Monetary Fund – has taken place under the guise of a bailout. So the euro has come to epitomize the dominance of German capital in particular. Is the spectre of ‘herrenvolk democracy’, in the words of Domenico Losurdo,  again haunting the rest of Europe? Or is this simply a new form of colonialism? The irony in Greece is that the biggest tax evader is apparently a huge German construction company called Hochtief, which owes an estimated one billion euros. Be that as it may, the country has been saddled with an odious debt that simply cannot be repaid. And what has transpired in Greece is of historical global significance as it is not only an emergency for that country or the nation-state in general, but it is, at root, an unprecedented global capitalist catastrophe that we are dealing with. The immediate onset was the 2008 Great Recession, but has become an economic downturn for the working people with no end in sight. Of course, fragile countries like Greece experienced the crisis first, but all countries on the periphery of global capitalism, such as Spain, Portugal, Ireland, Italy and Puerto Rico, have experienced the consequences more harshly, and have become much more subordinated to financial capital. What are the implications of this capitalist crunch for South Africa, Africa and the working class in general? What is undoubtedly disconcerting about the Greek statistics is that these are so familiar to the people of the Global South. The South African unemployment rate, for instance, is 25% (July 2015), but has been like that for a very long period already. In Namibia, 90% of the population cannot afford a decent house because of the deregulation of the finance sector, and the skyrocketing house prices. The repression in Zimbabwe emerged as a result of the resistance against austerity there. Indeed, what is unfolding in Greece has been occurring in Africa and the Global South since at least the 1980s, with the implementation of neoliberal or structural adjustment programs. The difference is that the Greek people are resisting because they compare their current social situation to their previous social democratic setup, while the people of Africa (and the Global South) compare neoliberalism to colonialism (or apartheid). And with the connivance of the African ruling elite, this neoliberal setup has been presented as being ‘liberation’ and the best possible world. South Africa was already among the most unequal societies, but this was worsened by the combination of the global hegemony of neoliberalism, and the dreadful deal negotiated by the African National Congress (ANC) during the secret economic negotiations in 1994 that agreed, for instance, to the private ownership of the South African Reserve Bank. In fact, all the other countries of the Global South, such as Namibia and Zimbabwe, long ago implemented the bitter medicine of austerity under the smokescreen of ‘liberation’. However, South Africa – unlike Greece – is not peripheral to the global economy. If anything, it is a sub-imperialist country in terms of its economic dominance of southern Africa, and its political influence on the continent. Nevertheless, because of the high level of social inequality and the militancy of the working class, South Africa represents a weak link in the global chain of capitalism. The situation in Greece exemplifies a crisis of liberal democracy. The implementation of the austerity measures – despite the liberal-democratic referendum – represents a huge defeat for the Greek working class. The working class has since begun to realise that Syriza – which has effectively collapsed after just eight months in power – was a left-reformist or social-democratic party that was not committed to the concerted fight against austerity. However, the European ruling elite chose to make an example of Syriza, and to embarrass that party in order to send a tough political message to the rest of the European working classes – especially those in Spain, Ireland, Portugal and Italy. The elite will not negotiate away their political and economic power. And the financial aristocracy is immensely powerful as they control the flow of money through the privately-owned central banks where unelected and unaccountable technocrats decide the fate of millions despite the outcome of democratic elections. The German Finance Minister Schäuble was quoted as having said that ‘elections don’t make any difference’. So, liberal-democratic parliaments have again been shown to be marginalized, and to not reflect the will of the people. If anything, there is probably a fascist or military government on the horizon in Greece. And this should serve as a warning to the people of South Africa and the Global South – the only way to ultimately maintain these austerity measures is through force. For the left-wing, the inference is that liberal-democratic elections are an essential tactic in terms of doing political conscientization, but will not bring about social transformation. Rather, the left-wing should prioritize the organising of grassroots democracy through workers’ committees, civics, women’s and youth organisations, etc. There is simply no parliamentary road to fundamental change. With Syriza in the process of disintegration due to its compromises and reformism, the political lesson for the working classes is that thorough-going change only comes about through direct action. The way forward for the left-wing is through mass engagement, i.e. general strikes, marches, sit-ins, factory occupations, etc. The implementation of a left-wing program would only materialize through collective action. The situation in Greece shows that the rise and fall of political parties reveal the shifts in mass consciousness. And the left-wing leadership should be able to gauge this correctly. What Syriza should have considered was to permanently mobilize the Greek working class, the Spanish working class, the Irish working class – but in particular the German and French working classes – i.e. the working classes of the most industrialized economies. In the final analysis, the anti-capitalist struggle is about the balance of social class forces. The ruling elite – and finance capital in particular – would not give in at the negotiation table when they comprehend that the working class is timid in the streets. Compared to the Greek workers, though, the South African working class is in a much more powerful position. The South African/Azanian left-wing realises that socialism cannot be constructed in one country only. As much as this Left ought to link up with a working class in an industrialized country, the rest of southern Africa constitutes the logical terrain to which the far-reaching struggle should be extended to as a point of departure. This is partly the case due to the sub-imperialist nature of the South African ruling elite. This state of affairs should be reflected not only in the strategic and philosophical features of the left-wing, but also in the organisational aspect of the left-wing. Simultaneously, the Left ought to be mindful that xenophobia in South Africa could lay the foundations of a fascist movement that could smash the working class movement. Stated otherwise, the South Africa Left ought to engage in direct action. And this should be led by an action-orientated mass workers’ party. Bond also points out that the left-wing activists in the United Front seem to have ‘differing notions’ of what a left-wing political party should look like and that ‘inadequate groundwork’ has been laid for the discussions around such a party. Furthermore, he forewarns that the United Front should not repeat the mistakes of the United Democratic Front (UDF) with its ‘excessive caution by a petit-bourgeois leadership’. And, it could be added, that the South African Left must not replicate the blunders of Syriza. What is required is a bold leadership with no illusions about reformism. It also ought to be clarified that any left-wing organisation that comes to power in Namibia, Zimbabwe or, for that matter, any peripheral country today, would be in the exact same position as Syriza. For, it would lack the political or economic power to bring about radical changes. The reality of a global politico-economic system – policed by imperialism – makes it impossible for undernourished countries to break with capitalism and to begin to build socialism. There are many crucial warnings for the leftists today in the Greek situation. A key lesson for the South African radicals is that – if they were to obtain power – they would have to extend the anti-capitalist revolt straightaway to the rest of southern Africa and beyond – and would need to have the solidarity of at least one working class in an industrialised country. On the other hand, the only way to build socialism in Namibia or Zimbabwe is through linking up with the rest of the sub-region and in particular the working class of South Africa. It is high time to initiate a sub-regional left-wing structure. Instead of the outdated social-democratic program of Syriza, the Left ought to hoist the banner of an anti-capitalist political program that would include the democratic management of the financial sector, job sharing as a way to overcome mass unemployment, decent public housing, a basic income grant, etc. A dialogue is also warranted on the shortcomings of a single currency, the gains of decentralization and in general multilinear approaches4 to socialism given the uneven and combined development of capitalism. The defeat of Syriza – a broad left party – has once more raised the matter of the character of the political party that could bring about radical socio-economic shifts. A non-sectarian party of dedicated activists is certainly needed, yet it should not be an elitist vanguard group but a mass workers’ party that should have a solid base among the urban and rural working classes. Such a working class-based party ought to concede to the highest level of internal democracy through the right to tendencies, not allowing the leadership to wear two political hats yet actively encouraging the rank and file to do so. So, the Syriza project is over, but the struggle continues. Anderson, Kevin (2010). Marx at the margins – On nationalism, ethnicity and non-western societies. The University of Chicago Press. Bensaïd, Daniel (1987). Revolutionary strategy today. International Institute for Research and Education (IIRE). Notebooks for Study and Research, No. 4. Ross, Kristin (2015). Communal luxury – The political imaginary of the Paris Commune. Verso.